It's never hard to find sushi in Austin as long as your tastes run to the perfunctory, but if you're a sushi bar looking to offer more esoteric items such as katsuo (bonito), kanpachi (amberjack), remora, scorpion fish, african pompano, triggerfish, or shako ebi (mantis shrimp), you might want to give Sashimi Grade a call. 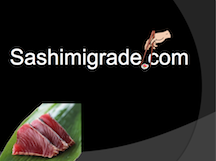 Sashimi Grade is an artisan seafood supplier operating out of Corpus Christi. Their "sustainable" seafood is poll-and-line or troll caught and is "super frozen" at -76 F to ensure the freshest possible result. They often catch such small quantities that they will never advertise them, but only offer them to their select sushi bar customers. They are currently catching fish from the Gulf of Mexico, but hope to be bringing in fish from the Pacific soon. Interested sushi bars should contact them. Need convincing? Download their presentation (PDF format).